Who spends a week in Athens? Athens is someplace you pass through for a night or two, just enough time to see the Acropolis before moving on to one of the Aegean islands. Well, in early May it's still a little too cool on the islands, but Athens is already basking in summer heat. 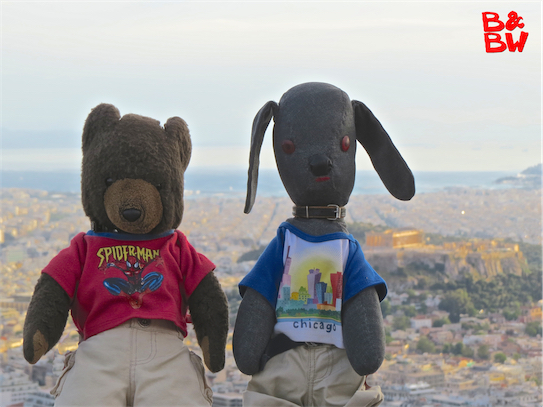 In May 2015 Bear and Bow Wow decided to go against the grain and so for their first trip to Greece they spent an entire week getting to know the ancient Greek capital. First stop the Acropolis. The Acropolis of Athens is an ancient citadel located on a high rocky outcrop above the city of Athens and contains the remains of several ancient buildings of great architectural and historic significance, the most famous being the Parthenon. From the Acropolis you can see pretty much all of Athens. In Athens, buildings are not allowed to surpass twelve floors such as not to block the view towards the Parthenon. Move your cursor over the image for a different shot. 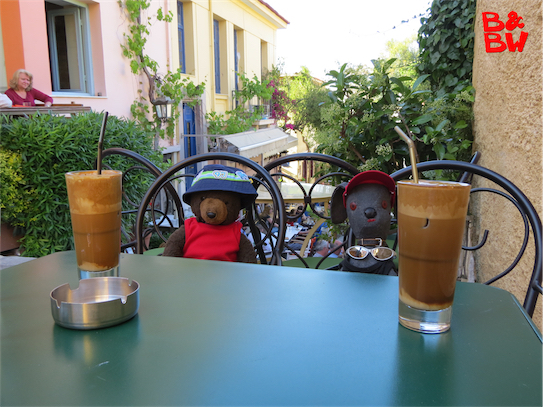 After a few hours walking around the ruins of the Acropolis, the boys headed down to the Plaka, the oldest neighbourhood in Athens in the shadow of the Acropolis.They found a quiet little cafe on a little alleyway and ordered two frappés. The frappé is a Greek foam-covered iced coffee drink made from instant coffee which is the most popular coffee among Greeks and foreign tourists. Move your cursor over the photo for a close up. 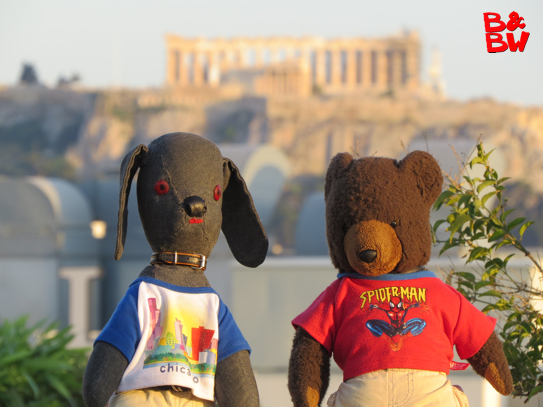 The boys never tired of looking at the beauty of the Acropolis. Fortunately, the rooftop bar at their hotel afforded them an excellent view. Move your cursor over the photo for a different shot. 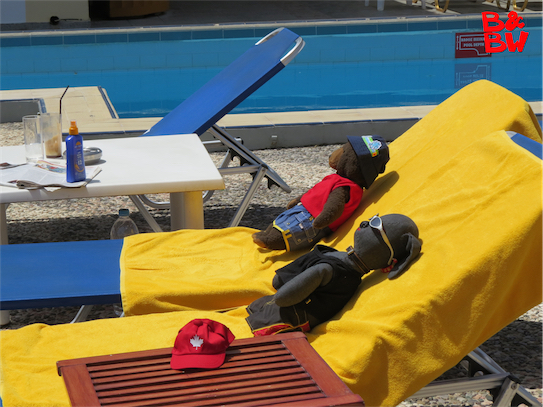 The hotel rooftop also afforded them access to a pool and lounge chairs for suntanning. 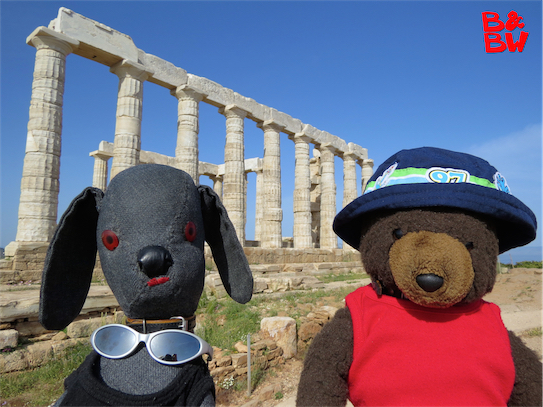 The boys took a day trip to Cape Sounion to see the Temple of Poseidon, the god of the sea in Greek mythology. Cape Sounion is on the southernmost tip of the Attica peninsula, southeast of Athens. 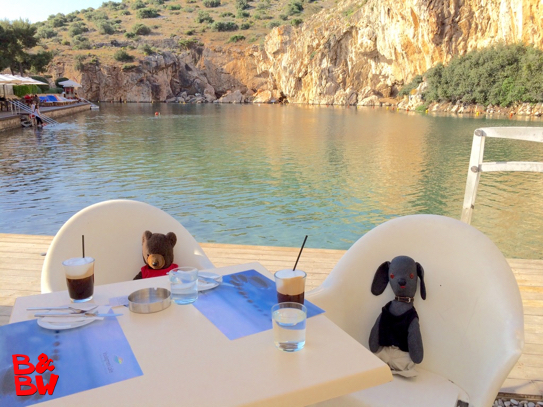 If you're still looking to escape the noise and frenetic pace of Athens another nice day trip is Vouliagmeni Lake, a mineral spa that is reported to have many healing properties for ailments, such as eczema, headaches, arthritis, sciatica and other problems. More importantly, it also has a good restaurant and well-stocked bar. 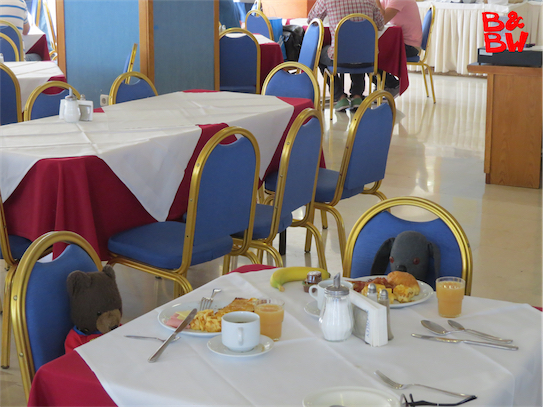 One of the things the boys love most about European vacations is the free, all-you-can-eat breakfast buffet. Here the boys can fill up enough to keep them going until their mid morning coffee break and snack. Another must-see spot for any tourist is Syntagma Square, the central square of Athens. Syntagma, the Greek word for constitution, is named after the Constitution that the first King of Greece Otto was obliged to grant, after a popular and military uprising on September 3, 1843. 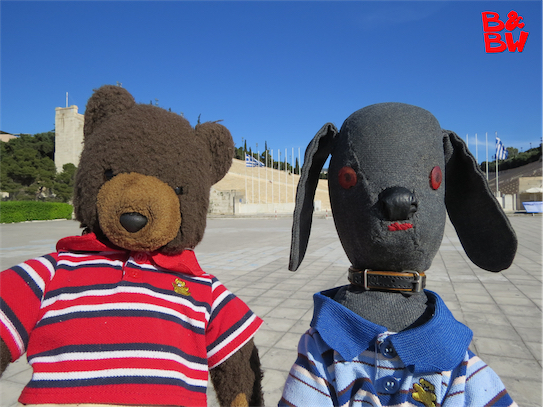 Here the boys are standing on Amalia Avenue directly across from the neoclassical Old Royal Palace, which has housed the Greek Parliament since 1934. 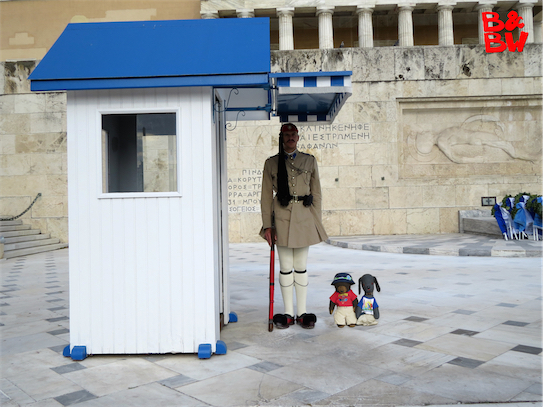 Every hour, the changing of the guard ceremony, performed by the Presidential Guard, is conducted in front of the Tomb of the Unknown Soldier on the area between the Syntagma Square and Parliament building. It's a popular spot for tourists to take photos. If you're patient and wait until the end of the Changing of the Guard ceremony, the guards will allow you to pose for a souvenir photo with them, as the boys have done here. One of the most beautiful spots in Athens is Mount Lycabettus, a limestone hill rising 300 meters (908 feet) above sea level. 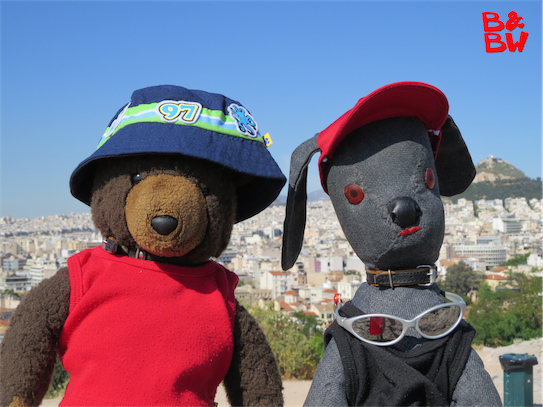 From here you can see pretty much the entire city of Athens, including a spectacular view of the Acropolis. 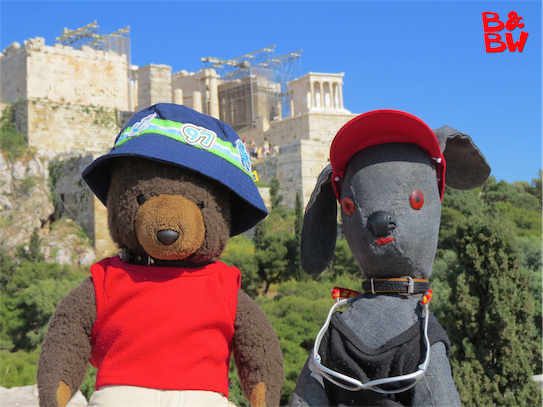 The boys chose to go up late in the afternoon when the Acropolis would be bathed in the golden late day sun. Move your cursor over the image for a close up of the Acropolis. Oh look! Free food! 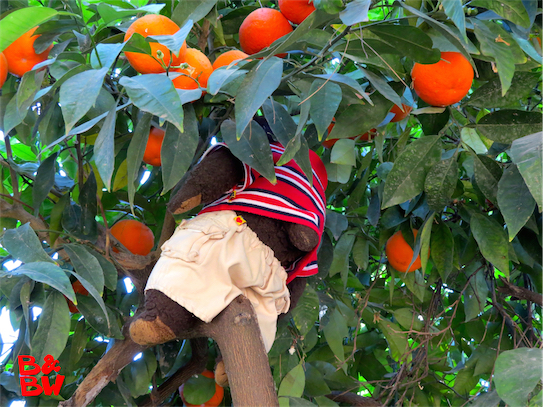 Walking through the beautiful National Gardens, next to the Old Royal Palace, Bear spotted some orange trees and just couldn't restrain himself. Now if only they could find pancake and waffle trees they'd be all set for the next day's breakfast. On the last day of their trip the boys stopped by the Panathenaic Stadium which hosted the first modern Olympic Games in 1896. Reconstructed from the remains of an ancient Greek stadium, the Panathenaic is the only stadium in the world built entirely of marble and is one of the oldest in the world. "Would you care for a top up on your wine, Mr. Wow?" 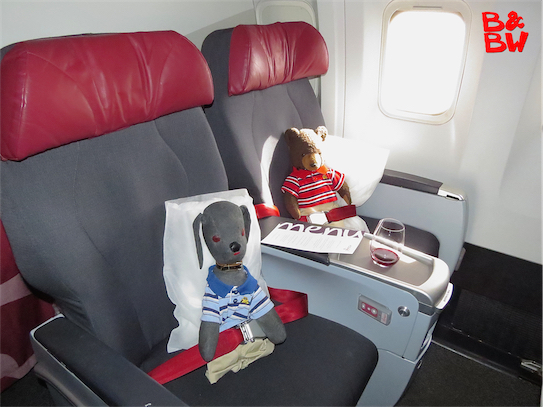 Okay, so they aren't quite business class pods with lie-flat beds, but for the 11 hour flight home to Toronto, the Premium rouge seats on Air Canada rouge are comfy enough, as long as the flight attendants keep your wine glass topped up. Click here to see more travel photos. No products here yet, but we hope to have some soon.